Tautona Lodge is some 5 kilometres north of Ghanzi, Botswana and is ideally situated for the through traffic that is gaining momentum with the Trans Kalahari Highway becoming a main artery from Gaborone and South Africa to Namibia and north to the Western Delta, Maun and the Okavango. The lodge has risen like the phoenix from the barren wastes of the Kalahari in amazing fashion and its main building and satellite chalets are attractive in design. There are a total of 28 rooms, including a number of family rooms and a double storey Presidential Chalet with three bedrooms. Most of the chalets have a mini kitchenette for the convenience of self-catering travellers. The two swimming pools are a most welcome retreat in the hotter months and there are television and telephone facilities for the modern traveller who needs to catch up with the rest of the world. Tautona caters for buffets and banquets and other special occasions for the local population. All staff are recruited locally and trained under the tutelage of Marie and Greg Soutter, well known in the hotel industry in Botswana. Lodge also has a camp site, catering for caravans and campers, with good ablutions and pleasant surroundings. A waterhole nearby guarantees plains game such as kudu, impala, steenbok and waterbuck in the early evening or morning, and a curio shop and soothing water feature is being commissioned. 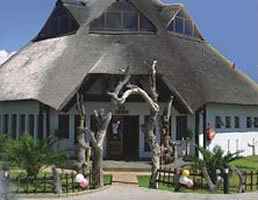 Tautona boasts a large restaurant, pool bar and conference centre. These facilities have proven popular with the local Ghanzi patrons. Altogether a much needed oasis on your journey through the Kalahari. Airport transfers are available on request. Communication with this Lodge is often problematic, please be patient. Hosts will endeavour to get a reply to you as soon as possible. THE LODGE IS SITUATED ON A 10 000 HECTARES GAME FARM AND IS APPROXIMATELY 4.8 KILOMETRES FROM THE GHANZI CENTER.